Fur Violine, Viola und Violoncello. Composed by Franz Schubert (1797-1828). Edited by Werner Aderhold. This edition: urtext edition. Stapled. Barenreiter Urtext. Study score. Duration 2 hours, 30 minutes. Baerenreiter Verlag #TP00306. Published by Baerenreiter Verlag (BA.TP00306). ISBN 9790006204649. 22.5 x 16.5 cm inches. Text Language: German/English. Preface: Werner Aderhold. 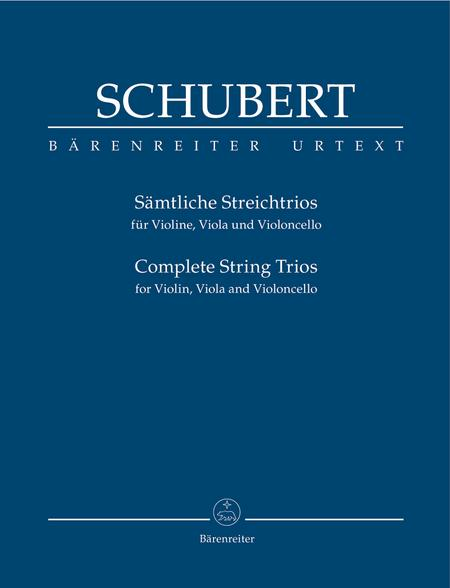 This study score of Franz Schubert's complete string trios (violin, viola and violoncello) takes its text from the New Schubert Edition. It also includes Schubert's very first essay in the genre, which only resurfaced in 1997: the draft trio in B-flat major, D 111A (1814). Besides this draft, two other trios in B-flat major written a short while later have come down to us: D 471 and D 581. The first is likewise a fragment as it breaks off in m. 39 of the second movement. D 581 survives in two versions, the first based on the autograph score, the second on a set of parts prepared and thoroughly revised by Schubert. Both versions provide useful performance alternatives that differ widely in their form, rhythm, articulation and dynamics.